A Journey To Niyamgiri, A Celebration Of Life, Activism And Struggle! Over six decades ago Pandit Nehru, the country's first Prime Minister, famously declared India’s 'tryst with destiny' and promised to make Independence a vehicle of future peace, prosperity and democratic rule for all his countrymen and women. But for millions of Indians living in this vast and diverse land it is as if Independence never arrived and our colonial rulers never left. There are two simple questions they pose that nobody seems to have an answer for. Who exactly got the freedom that India is supposed to have achieved? And WHO does this country really belong to? Is Judiciary Biased Against Adivasis? The Corporate Home Minister P. Chidambaram must leave his office, precisly because he is responsible for the brutal killing of all the innocent villagers including 17 innocent Adivasis of Kottaguda, Sarkeguda and Rajpenta villages of Chhattisgarh. The questions should be asked to Mr. P. Chidambaram that is it enough to say sorry after taking away the precious lives of 17 innocent people? Will Meena Khalkho's case be picked up by the mainstream media like they did Jessica Lall's? Or will the difference in her political environment and class position and, above all, her distance from Delhi, be too much to bridge? Is There Anyone To Hear This Boy’s Cry? 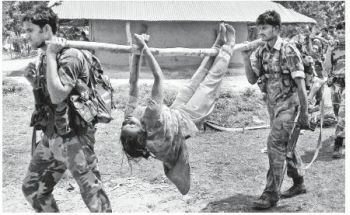 Maoist Kidnappings: Who Gains By The Blame Game? The real and obvious agony of the families of these two officials (and the families of others killed in Maoist attacks and ambushes) is brought out by the electronic media, but it ignores the agony of families of thousands of adivasi people who have been victims of governments' economic violence and police depredations over the decades. Is the electronic media being impartial or partisan? Can Anyone Save This Tribal Girl? Hegemony Overthrow or Political Power Seizure? Perhaps, Rahul Gandhi is much worried on the matter of Adivasis deserting the Congress Party rather than protection of their rights therefore he intends to get back the lost Adivasi vote bank by projecting himself as their soldier. The relevant question here is if he is Adivasis’ soldier then whose government has been carrying on eviction of the migrant Adivasis in Assam, Salwa Judum in Chhatisgarh and Operation Green Hunt in the so-called Red Corridor? Not Only Niyamgiri: Stop Resource-Grab Everywhere! On 17th August 2010, social activist and our General Secretary, Naba Dutta, had been arrested from West Medinipur. Owing to unprecedented public outcry against the arrest, he was granted bail next day, but not before serious, and totally fabricated, criminal charges were brought against him. Why and how did this happen? This Is Your Army Mr Chidambaram! US media have never called millions killed in their own homes, by US military during invasions and occupations since Korea through Iraq, mass murder. Likewise, the annually legislated starvation of millions of Indians in the 'largest democracy in the world', is never called mass murder. India buys WMD, with money saved, seeks to use the market to solve the problem. NY Times fields a question, “Should Food be a Right? Dear Chhattisgarh Police, Are You Mad? Economics That Causes Militancy: W(h)ither The Republic? It was time that one should check up what type of governance tribals had before the civil administration collapsed? A basic ingredient of any civil administration is the administration of justice. How was it done before the territories were “lost” to the Maoists? For Whom Are The Forests Turning Red ? Attack On CRPF Camp Or Fake Encounter? Abhijit Dutta argues that the Indian Middle Class should be engaged rather than castigated in the people's movement against government of India's "Operation Green Hunt"
Now the tone is changing gradually regarding yesterdays train mishap. A foot and half of fish-plates were found removed. A BBC cameraman has displayed the gap in one of their broadcasts. No evidence of a blast any longer. No evidence of gelatine, dynamite, ammonium nitrate. The foreign press had already expressed some caution, in their statements and terminology. But not the Indian press. They are so free, unfettered and dynamic when it comes to spreading innuendo! Have You Looked At Barsa Lakhma’s Face? The Hindu, 25 May, posted the above photograph of a person on its frontpage under the head “Six Naxals held for Dantewada massacre”. The person, Barsa Lakhma, is alleged to be a Naxal “leader”, a “commander” who is said to be involved in the gunning down of 76 security personnel. Take a close look at Barsa Lakhma’s face. With his puzzled eyes and full cheeks, how old does he look like? 15? 16? Footage of the police firing at Chandia village on 12 May 2010 that caused the death of Lakhman Jamuda, aged 55, and an active member of Bisthapan Birodhi Janmanch.